Sindoor khela is part and parcel of the last day of celebrations of the Durga Puja. This is performed in front of the idol of the Goddess before she departs for her in-laws place. The sindoor (vermilion) is a mark of married life and applied on the forehead. On this day married women apply sindoor to the idol of the goddess and then every married woman goes around applying it on each other’s forehead and on iron bangles. The significance of this ritual is to pray for longevity of the life of the husband and peace and prosperity of the family. The color red signifies matrimonial bliss among Hindus. Last week we had Shivratri Pooja at home. We usually do it on the Shiva Lingams. My father was the designated priest. The Shivratri Pooja entails fasting the whole day…….. sometimes the previous day and the next day as well. Depends on the austerity of the rituals you wish to follow. The pooja takes place at the last prahar of the day or anything between 930 and midnight. My grandfathers both side usually did it at midnight……. but dad cheated improvised a little as we were all hungry tired and could not sustain any longer…… and did it earlier than usual. The Shiva Lingams are bathed in milk, yogurt, ghee, (clarified butter) honey, and sugar…… ie the panchamrit and lastly water. The offering of bel leaves and bel fruit is given and then lastly flowers, fruits and sweets. Lastly we pray for peace health and happiness of the whole family. During Durgotsav, Goddess Durga is worshipped in all feminine forms – Shakti, Shanti, Mother, sister and Daughter…… Kumari (unmarried girl). Little girls of age 3 to 9 are dressed up in the solah singars with alankars (jewellery) like bangles, earrings, necklace, Maang tika, bindi…… I honestly wouldn’t be able to translate all of them for you to sum it……. she is dressed like a bride and then the priest prays to her as he would to the Goddess. She is offered flowers, food of her choice (even Chocolates), incense and arati is done of her like it would be done of the Goddess. The best part of the whole thing is that the little girl then gets to bless everybody. I find it really hilarious when the little girl is asked to hold the shanti mudra and bless people who are more than 10 to 20 times her age. Out of all the Kumaris that I have taken pics of during Durgotsav this little girl has captured my heart forever. 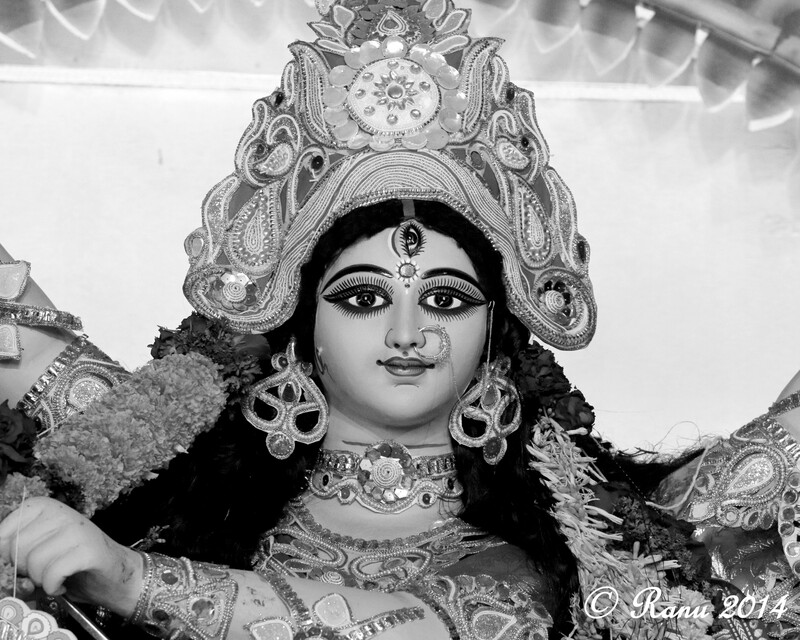 She was so calm and serene all through the rituals……. probably bribed big time by her parents but the end result was beautiful. I was so enamored by her that I just couldn’t stop taking pics of her……. very very photogenic I have rarely seen a little girl of her age so patient and calm.